The 50-day full-time course is structured according to the new FGASA requirements for Field Guide Training. 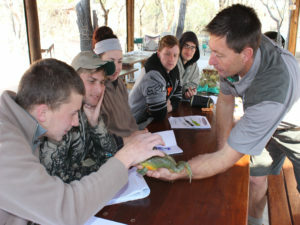 The extended course will ensure that students will be better equipped to meet the demands of the nature guide fraternity and allow for a higher standard of preparation, training, and assessments.The course combines lectures with practical fieldwork, followed by written tests and/or assignments. 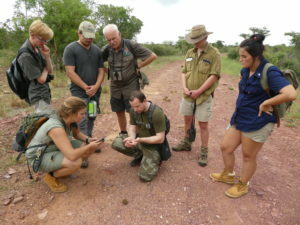 The acquired level of knowledge and skills will provide the student with the ability to interpret and explain the natural environment to guests in an interesting and stimulating way, while providing them with a unique and enriching nature experience. Theoretical and practical training time (face to face). Formative assessment and learner presentations. The main aim of the course (face to face training time) being offered at the training provider’s facilities is to provide learners with practical training in guiding and interpretation skills. The main part of the course is presented at Combretum Park, but two to four day practical excursions will also be undertaken to places such as Marakele National Park . One day excursions to places of interest, are also included. 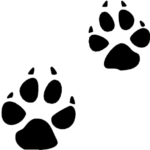 This is done to expose students to different cultural-historical aspects of the area as well as other ecological areas with different geologies, plant communities and thus animals. The course fee includes, lectures, tuition during practical fieldwork, course material, meals, accommodation, and entrance fees into parks and reserves during practical sessions and excursions. The First Aid Level 2-training and the FGASA practical assessment are also included in the course fee.